Note: Click on the title (above) to be redirected to a website that defines Asperger's Syndrome. Before I start, I want to tell you a little about Noah. 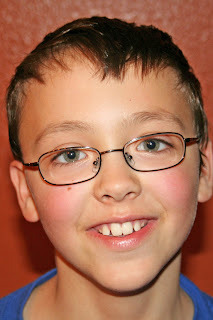 He is almost 11 and was diagnosed with Asperger's Syndrome at age 3. He used to be a very difficult, frustrating child. He had violent tantrums, was very set in his ways, didn't maintain much eye contact, hated other children, and didn't bond much with people. He has come SO far that we can hardly believe it. 1. He has big, beautiful eyes and long lashes. 2. He has cheeks like apples -- in our family we call them "smile balls." 3. He has a hilarious laugh. 4. He has an amazing memory. 5. He is a creative writer. 6. Academics come easily to him. 7. He won his school's "Geography Bee" in 5th grade. He was 2nd place the year before. 8. He does well in school even though he is a year younger than his classmates. 9. He is learning to make friends at school. 10. He no longer needs autism therapy. 11. He is super-skilled at Nintendo Wii, especially MLB PowerPros (baseball). 12. He enjoys reading -- a skill he picked up "just like that" when he was 2. 13. He loves his younger brother. 14. He recently became a sports fan, and now he and his dad have a huge connection through sports. Their favorite teams are the Green Bay Packers, the Milwaukee Brewers and the Florida Gators. 15. He cares about how his bedroom looks, and he arranges his belongings the way he likes them. 16. He empties the dishwasher when we ask. 17. He is in karate, and is currently a brown-stripe belt. He'll soon start working toward his black belt. 18. He never complains about going to church and he has accepted Jesus as his personal savior! 19. He gets his homework done. 20. He is very detail-oriented about some things. 21. He gets deeply into projects. 22. He loves to collect baseball cards, sort them and look them up in his books to see how much they are worth. 23. He loves his dog and plays with him. 24. He isn't very picky about food. 25. He eats his vegetables and vitamins. 26. He doesn't need reminders anymore to use the toilet. 27. He has learned how to carry on a telephone conversation. 29. He now uses pronouns properly and has a pretty typical pattern of speech. He no longer needs speech and language therapy. 30. He's become much more physically coordinated. 32. He has learned to not blurt out in class, and is able to cope with not being called on when his hand is raised. 33. He no longer insists on being first. He used to have to be first for everything, including going through doorways. 34. He enjoys taking photos and home movies. He'll even make up his own "Mr. Bill" or "Nativity" stories and record them. 35. He now holds his pencil the "typical" way and has nice handwriting. 36. When he's sick, he is cooperative about taking medicine. He's also very polite and sweet when he's sick, for some reason! I will add more when I think of them!